Blended Play is an easy online gaming portal where users review content in any subject through games displayed on a screen. Click on the video below to watch a tutorial explaining how to get started with Blended Play. Prefer to read about it? Click here to consult our PDF guide to get started! Thanks to Technology for Students and Teachers for taking the time to create this video! You can follow them on twitter @tech4educate and see more of their awesome videos on their Youtube channel by clicking here! 1. In the member’s section users can select a game to play by clicking on it. 2. Once the game is launched, a ''new game'' can be created or an existing question file can be loaded from the user's account. 3. The user then decides on the length of the game to play (corresponding to the number of questions asked), the number of teams and whether or not to display questions on screen. 4. Finally, users write the questions that they want to see appear in the game and their answers. Once the questions are entered, teachers can save their question set for future use (it will then appear in their Member’s account and in the community if that option is selected) and launch the content in the game. 5. It is now time to play! Once the game is launched, it will appear on the projector where questions can be asked of groups of students who will battle for victory. 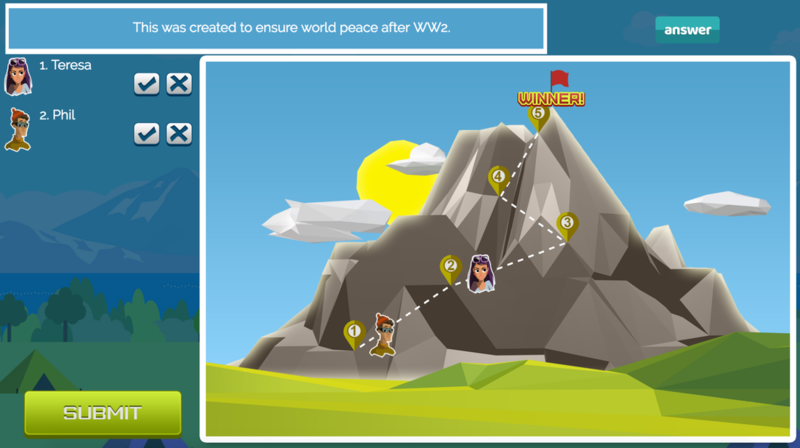 Blended Play games can be configured to allow the best review environment for every type of content. The games allow the user to display the questions on screen. A button next to the question box reveals the answers as needed. For some content (such as spelling) or to use the game with external material (like youtube videos or texts), the game can be modified to display a generic countdown. your own files to help build the library of content!